Proprietor of the now closed Olde Bell Pub on Loi Kroh Road, Pedr Fawkes, greets friends and well-wishers on the final day of the pub, Sunday, June 30, 2013. Pedr and his wife Beer have welcomed locals and visitors to the Olde Bell for 7 years. We wish them well in their new venture. Skål Chiang Mai and the North held their monthly meeting and dinner at the Old Chiang Mai Cultural Center on Wualai Road on Thursday, June 27, 2013. Lamorna and Patricia Cheesman of Studio Naenna spoke on South East Asian and Lanna textiles and members enjoyed a wonderful dance performance. Members of the Facebook fanclub of La Fourchette French Restaurant in Chiang Mai met at the restaurant, located opposite Wat Chedi Luang, for dinner and to inspect the progress of the new air conditioned room that is being installed by Chef Oh and the team. 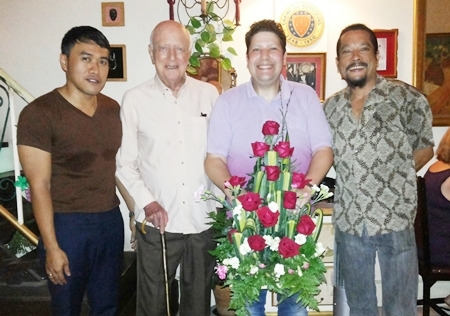 The La Fourchette team presented a bouquet of flowers to Dirk Weeber-Arayatumsopon to thank him for creating the fan page. 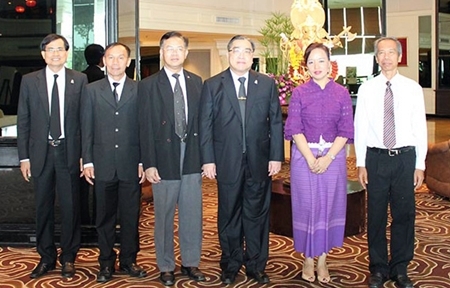 Ms. Stella Jacobs, General Manager of Holiday Inn Chiang Mai, welcomed Mr. Wirat Chinvinitkul, Secretary of the Courts of Justice, and top executives during his official site visit to the construction of the Official Residence in the Northern area, at Holiday Inn Chiang Mai last month. Anchan Vegetarian Restaurant on Soi Hillside 2 on Nimmanhaemin Road hosted a birthday party for Nicole Rossetti-Lestrange and her friends on July 4, 2013. From left; LiLi Tan, Aaron Espana, Tracy Williams, Nicole, Shana Kongmun, Jo Tatun and Kevin Hassall. 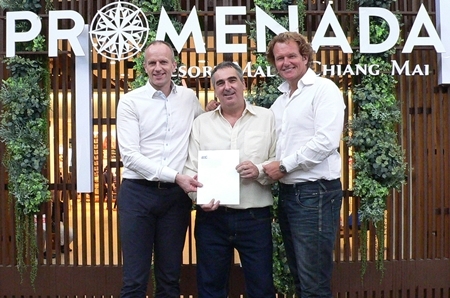 Chiang Mai - ECC International Real Estate, the developer of Promenada Resort Mall Chiang Mai, the first resort style shopping mall in Thailand, together with Ger Vos – a legendary singer from the Netherlands, recently donated money to the Philanthropy Connections Foundation. The bestowed 40,000 baht will endorse the foundation’s work, supporting orphanages and charitable associations in local area. Philanthropy Connections Foundation supports projects focused on vulnerable people in Thailand, Cambodia, Myanmar and Pakistan. From left: Tjeert Kwant, President and CEO, ECC International Real Estate; Sallo Polak, Executive Director of Philanthropy Connections Foundation and Ger Vos , a legendary singer from the Netherlands. Rimping Supermarket continues to grow in new areas around the city as it opened its latest store at the Star Avenue Lifestyle Mall on June 27, 2013. Here Warokarn Trantanont of Rimping is joined by the mall’s project administrator and other Rimping executives to cut the ribbon opening the newest branch of Rimping Supermarket. The Star Avenue Lifestyle Mall is located on the Superhighway in front of the Chiang Mai Arcade Bus Terminal. Intira Subhasean, President of The Provincial Red Cross Chapter of Chiang Mai (center) together with Chiang Mai Red Cross Committee received 100 school uniforms from Parunee Mutiwattanasawad, Director of Apparel & Accessory 1 Division, Central Marketing Group in Right & Share, S’Fare Gentlemen share clothes to children” project at Central Plaza Chiang Mai Airport on July 6, 2013.